Audinate has announced the worldwide availability of the Dante Software Combo Pack, combining licenses for Dante Via and Dante Virtual Soundcard for only $59.95. This bundle represents a 25 percent savings over purchasing the software separately. 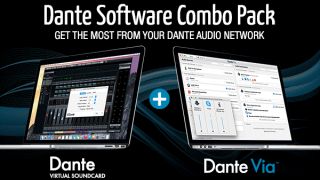 The Dante Software Combo Pack facilitates computer-based audio flexibility and creativity, including recording of up to 64 channels of audio using favorite tools with Dante Virtual Soundcard; sharing of audio from applications and USB devices with Dante Via; and creation of computer-only audio networks and connection to any Dante system. Dante Via connects all computer-based audio, including USB, Thunderbolt, and PCIe devices as well as audio applications, to any Dante audio network. Audio applications, connected devices, and Dante network endpoints are automatically discovered and displayed in a drag-and-drop interface. Dante Via supports up to 16-by-16 channels of audio for each application and up to 32-by-32 for each connected device. Dante Virtual Soundcard is designed to turn a computer into a high-performance Dante-powered recording workstation. Users can instantly connect to record, process, and play out up to 64-by-64 channels using any audio application and any combination of Dante-enabled devices and software. Like Dante Via, Dante Virtual Soundcard uses an existing ethernet port—no snakes, converters, special cables, or connectors are required. "The Dante Software Combo Pack offers a great value for two industry-leading software applications," said Joshua Rush, VP of marketing and product for Audinate. "Dante Via and Dante Virtual Soundcard both provide unprecedented routing of computer-based audio devices and applications."